We no longer support this application. You can keep on downloading and using it, further updates will not be released and no further assistance is given. 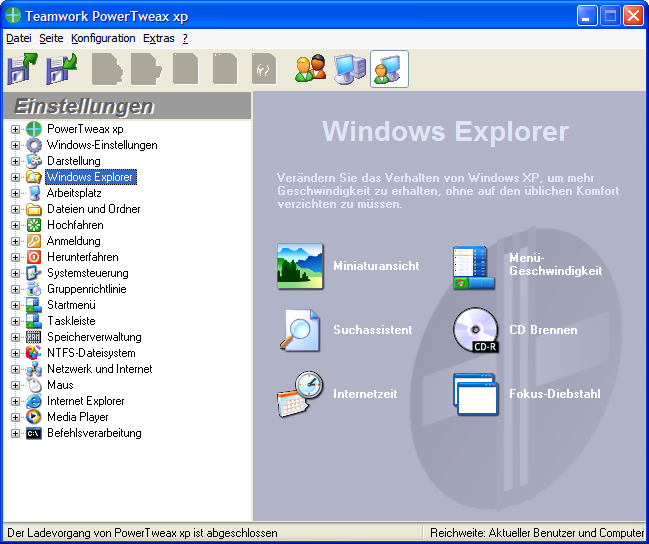 PowerTweax xp lets you configure your copy Windows XP easily and quickly. So even Windows beginners can customize their operating systems according to their needs and wishes. Ever wanted to improve the speed of Windows XP quickly? Now you'll have the chance to do so. 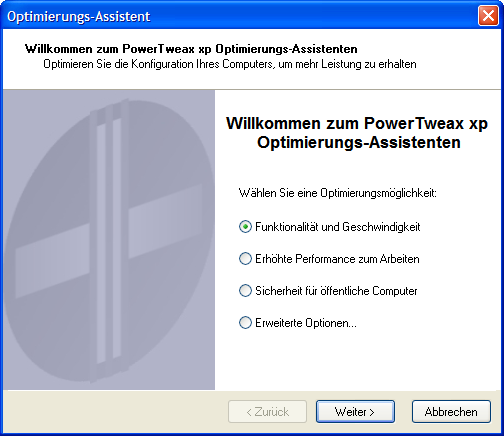 PowerTweax xp is easy to use while providing lots of options to speed up your Windows XP installation. There are twenty main categories with two to seven more specific sub-categories each, making for a total of more than eighty sub-categories with about 250 options. The performance wizard supports you in finding the right settings for your needs. Just enter your criteria and let the wizard do the work for you. 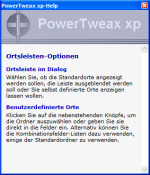 All changes are reversible and PowerTweax xp is able to reset the options to the Windows default values. A powerful administration mode gives you the opportunity to change the settings for some of your user accounts while leaving others untouched. You can prevent guests and limited accounts from accessing vital parts or settings of the system they should not change. This is an improvement compared to the Group Policy editor included in Windows XP Professional Edition, which applies settings merely to all users so even administrators are limited. The Home Edition doesn't even have this feature. owners of computers accessible by public should like the possibility to restrict users from accessing the registry editor and other important system functions. Available options include restricting access to the display settings and other control panel applets or the control panel itself. 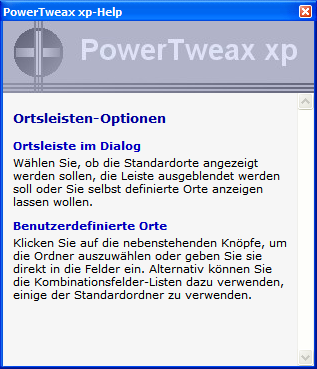 PowerTweax xp runs on Windows XP only, it won't work neither under Windows 9x nor with Windows Vista. At the moment the application is available in German only. Here's a bunch of features of PowerTweax xp. The registered version features 250 options.